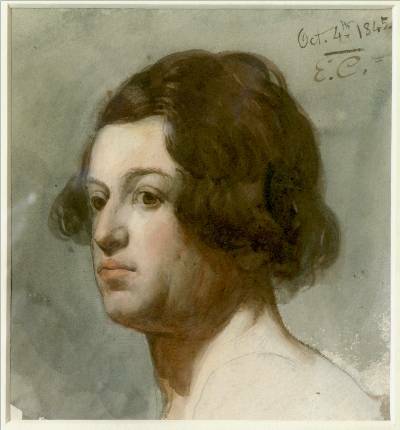 This watercolour does not have a title, but it was stated at the time of its sale in 2002 that it was considered to be of William Makepeace Thackeray. A close examination of the painting and comparison with later photographs of Eyre Crowe, however, leads me to suggest that it is fact more likely to be a self-portrait of the artist. It is possibly the same ‘Self-portrait as a young man’ that was in the possession of Eyre Crowe’s half-sister in Paris when his entry in the Dictionary of National Biography was published in 1912.